So yesterday was the 3rd Craft & Vintage Fair at the Working Men’s Club, Westfield Terrace in Higham Ferrers and the variety and standard of stalls was as excellent as ever! We had 3 amazing vintage stalls selling gorgeous jewellery and homewares, homemade cakes, hair accessories, crochet, wood carvings, wood turning, fabric gifts, book folding, various crafts from Rushden Mind plus more! It was lovely to have a chat with some already regular customers over a cup of tea too! On October 15th, 1-4pm, we will be holding a Baby & Kid’s Nearly New Sale / Craft Fair at Saxon Hall, Raunds (Thorpe St NN9 6LT). Here we can use 2 halls. The larger will have over 20 all handmade stalls selling a fabulous array of items including vintage inspired crochet, fabric gifts, chocolate novelties, greeting cards, scrabble pictures, handmade fudge, vintage upcycled furniture, dream catchers, handbag charms, tie dye bags, homemade jams and chutneys, book art, plaques and more! The second room will be for a Nearly New Sale where local people can sell preloved children’s items such as toys, books, equipment, clothes, maternity wear etc. There are still a couple of spaces so if you’re interested stalls are reduced to only £8 this time seeing as it’s the first one – and that price includes a FREE hot drink, cereal bar and bottle of water! If you’re interested please email me: rainbowcraftevents@yahoo.co.uk. Why not come along and grab a bargain! Lots of great quality items sold at a fraction of the original cost! Time to start buying a few stocking fillers..!? So it’s been a busy few months setting up the new Craft & Vintage Fairs at the Working Men’s Club which run at the same time as the Farmers’ Market – 9am-1pm on the last Saturday of each month. We’ve held two so far and feedback from stallholders and customers has been fab! We’ve had a great mix of stalls and an increasing number of vintage stallholders have started making bookings which I’m really pleased about. As these run during the Farmers’ Market, I (or lovely volunteers!) have handed out 100s of flyers to people in Higham to encourage them to come and visit us. I’ll carry on doing this to make as many people aware as possible. Stallholders have been very keen to make repeat bookings which is a great sign. To make it fair for all stallholders, and also to keep the range of stalls interesting for customers, I have limited the number of bookings for 2017 at this venue to 6. However, people are able to go on the waiting list for as many dates as they wish and I’ll let them know if a space becomes available. If you would like an up to date datres sheet please email me at rainbowcraftevents@yahoo.co.uk. 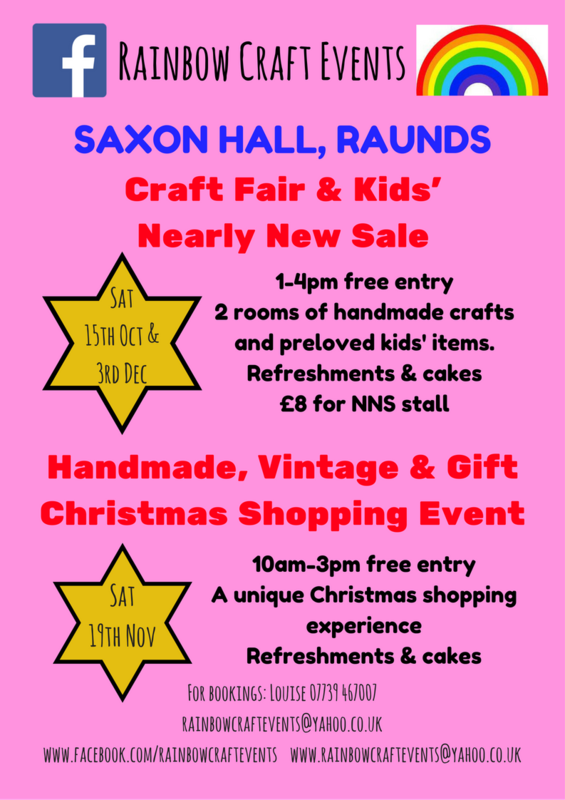 On October 15th we will be holding the first Nearly New Sale / Craft Fair at Saxon Hall, Raunds 1-4pm. This is an exciting new event for Rainbow Craft Events! The larger room will have 25 handmade stalls selling a fabulous range of items including jewellery, fabric gifts, book folding, handmade children’s clothes, dream catchers, bags, vintage painted furniture, scrabble products, cards and much more! There will be a chance to have a go at pottery painting too! The second room will have a Baby and Children’s Nearly Sale selling all sorts of items including children’s clothes, toys, books and equipment. Come along and grab a bargain! As always entry is FREE and there are refreshments and homemade cakes. If you are interested in having a table in the NNS room, stalls are reduced to only £8 and include a free hot drink, bottle of water and cereal bar. Sell your own items and keep whatever money you make! Please email me for more info rainbowcraftevents@yahoo.co.uk I hope you can come along and support this event. It’s not just children’s items! !